Last time I shared some of my reasons for choosing homebirth, and a bit about my experiences thus far. This time I would like to bring to you a few other opinions, from some real life friends/family who have also chosen homebirth! Her first child was an intended homebirth, but was born in the hospital after induction due to dangerously high blood pressure. Last two children were born in her home, with the same midwife I use. Both babies had issues with their umbilical cord (one had the cord wrapped around it's neck 3 times, the other had an extremely short cord which could have presented problems). Regardless, both births ended safely and she would definitely choose homebirth again. You don't have to labor anywhere but in your own home, where you are comfortable, in your own environment. You can have your hubby right there in bed with you after the birth. You can be more comfortable in your own bed and bathroom, and have everything you need right there. It feels safer. There can still be complications, but a good midwife knows how to handle these. You can choose to have any guests that you would like present at the birth. You and your husband stay in charge of what happens to their baby. No fighting with doctors and nurses over their ideas about baths, feedings, etc. She loves that her older children didn't have to go to the hospital environment to meet their new sibling, but could just visit and bond with the new baby at home. Jessica, mother of 1 (soon to be 2). Her first birth was a successful homebirth, also with the same midwife. She is choosing a homebirth again for this upcoming baby. "I chose homebirth because I knew that I would be more relaxed in my home than in the hospital, and therefore it would make the labor and birth easier because I wouldn't be tense. I spent hours in my soaker bathtub and it was wonderful. Overall, it was an amazing experience that I would love to repeat!" Amy (my sister-in-law), who just recently became a mother of 2. I attended her first homebirth, which was very intimate, beautiful and complication-free. It was great to see her and her husband so at ease in their own surroundings, and relaxing soon after the birth. Her newest baby, born two weeks ago, arrived in quite the hurry (about 40 minutes) and so she was thankful that they had already been planning a homebirth, didn't need to attempt to get to the hospital and already had everything they needed on hand! 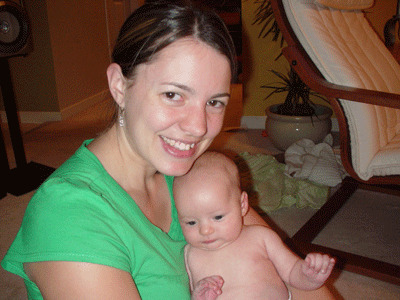 "My biggest reason for choosing homebirth is mostly about my comfort. I feel safe at home and I like that I can control my environment. I can do whatever I need to do. I also love being able to have a birthing pool. Hospitals feel white and sterile to me, full of interruptions. I feel as though I couldn't be focused and safe. I trust my midwives and I know what they can do if something were to go wrong." Want to know more about the safety of homebirth? This list is not exhaustive at all, but just a few links that I was able to easily find online. There are many books available, and most midwives should be able to provide you with reading on the safety of homebirth. When we made the decision to attempt our first homebirth, our midwife provided us with detailed information on the legality and safety of homebirth (with several studies and a lot of very encouraging statistics), including specifics for the province in which we live. For those who have had a homebirth, or are considering having one, are your reasons similar to the ones given above? What is it about homebirth that appeals to you? my reasons for homebirthing were similar to yours. Another reason is simply faith in God instead of faith in doctors. I believe that our society puts a great deal of faith in doctors, as if they can thwart God’s will if he would have someone to die. I am extremely grateful for medical technology and how much can be done for us these days, but above all we must put our faith in God. I’d love to try for a homebirth in the future, but with the insurance we currently have they are not covered. Unfortunately, we don’t have the funds at this time to pay for the midwife out of pocket. Sounds nice! Hope this next one goes well also. I have had 3 homebirths out of my nine children, and I wish I had done it for ALL of them. Basically? It just feels natural at home. Can’t put my finger on it, but immediately after my first one, I told everyone there, “This is how God made birth to be!” What incredible experiences they were! I would have a homebirth, if at all possible (which like I said before its not due to no midwives here). I would have one for similar reasons that you listed. Mostly because of the after the birth part though. Being at home and relaxing there and not having that hospital environment and interuptions. I couldn’t even sleep at the hospital, so I went two nights without sleeping (one for labour, one afterwards). Honestly as far as it goes for the actual birth I get so much in a zone that it doesn’t matter to me where I am for the most part. I thought the hospital atmosphere would bother me but I was focusing on the birth and I didn’t notice during the labour and birth. I hope that someday I can have a homebirth. My doctor told me that my last labour would have been ideal for a homebirth. Its too bad doctors can’t do them, since there aren’t enough midwives in rural areas (or any). This time around we are going to have a homebirth. I didn’t choose homebirth at first b/c I wasn’t sure how I would handle a natural birth – or how my body would, for that matter. After 2 uncomplicated natural births in the hospital, I felt like I was comfortable about trying at home. Especially after our son was born (the 2nd). He was large 9lbs 9 oz. and they kept checking his sugar all day b/c it wasn’t “high enough” to clear him. I have a medical background and I could tell he seemed fine, but because of hospital “protocol” they had to keep checking and I was too tired to dispute this. So, Lord willing, this July we will be having our first homebirth with a really great midwife!! I used a freestanding birth center the first time as we were an hour from any hospital. The birth center was that far away too, but if any emergency happened, then I thought we could get to help quickly. We also lived in a state where home births were illegal, so we had to drive across the state line to be at a birth center. Now we have moved and are expecting #2- this time with a home birth. We are actually further from a hospital- more like an hour and a half, but I feel comfortable now because I know more what to expect and what God made my body to do. I was so thankful the first time around that I wasn’t in a hospital because I would have gotten pitocin (since my labor was extremely long), and then the problem was positioning, which the midwife was able to correct during labor, so I know I would have had a c-section had I been anywhere else. I think if I was in a hospital, I would always be nervous of what they were going to do to me or the baby- much scarier than a home birth! Homebirths are somewhat of a sensitive topic for me. I would have loved to experience a natural birth, preferrably at home but I would have “settled” for a birth center! My first pregnancy / birth was extremely dangerous and I nearly died. In fact I am still facing complications from it, the most recent being that I had to be sterilized as a hole was torn in my heart from the first pregnancy and if I got pregnant again I had a 70% chance of dying. I am all for putting my trust in God, but I believe that God wants us to do all we can (or can’t, in this case) and then leave the rest up to him. So I chose to be sterilized. If it is His will that I get pregnant again, I am sure I will. Anyway, it hurt for a looong time that I would never be able to experience a home birth. It’s still a sore spot for me. One of my good friends is planning for a home birth in September and I’ve settled with reading as much as I can to help her, and passing her great stories of wonderful homebirths. All four of our children have been born at home, and (Lord willing) we’re planning to have our fifth at home (due in August). All of our births were attended by a CNM (certified nurse midwife). I have loved home birth for all the reasons listed above. One of the main reasons that home birth has been so great for me is that my births tend to be pretty fast. I usually don’t even know I’m in labor until I’m in transition. I think knowing that I’d have to get to the hospital would make me nervous (I’d constantly be wondering if I was in labor!). With baby number 3, both of my midwives were at other births and one of them made it as I was pushing. I’m having my baby in October, but I will be having a VBAC in an in-hospital birthing center an hour away. I want a home birth, but my husband does not feel comfortable (my first was a DISASTER that ended in a C-section, baby not breathing, etc. so he’s a little uneasy), so we found our happy medium. I have a doula and a midwife, and I’m going as natural and intervention-free as I possibly can (I plan on mostly laboring at home). If all goes well with this one and I’m able to have a successful, wonderful birth experience free of interventions, my husband is more likely to go for a homebirth next time! Breanna, I don’t personally know anyone who has done it (at least, not on purpose, lol!). I’ve read a bit about it, and I can understand some of the reasons why someone might choose to go that route. Personally, it’s something that my husband and I have discussed and don’t think that we would choose ourselves. We are so fortunate to be in a situation where we are able to have a certified midwife do all of my care, and attend our homebirths, and to have it covered financially by our medical plan. For me, I am not bothered by the presence of 1-2 midwives at my birth, and in fact, I welcome their care, their comfort, their suggestions, and their ability to handle things should a situation go in an unfortunate direction. I know of several birth stories (of friends) where although there was not an extreme danger, it was so helpful to have the experience and knowledge of the midwife present. What could have been a potentially dangerous situation was completely safe, because of her expertise. In fact, my first birth could have ended badly, had my midwife not taken charge of the situation and suggest that we transfer to hospital. As well, in my last birth, my son was born quite blue, and although he may have been just fine with no intervention, I was grateful that he was able to receive oxygen through the care of our midwife, while I snuggled and rubbed him immediately after the birth. Our homebirth was unassisted, although, it wasn’t planned that way. It was our fourth baby, and I have had all uncomplicated, vaginal deliveries. We knew, because of the contractions I had been having, that the baby would most likely come very quickly. My husband does have his EMT cert., and we had to stop twice to pray (and to calm the nerves!!!) We did not have the ability to have a midwife due to insurance. 1. All glory goes to God that we are okay… it was not the doctors, the medical equipment, the wonderful nurses or doctors. But, this is double-edged. I was amazed that God created our bodies to do exactly what mine did, and I was also amazed that God protected us and nothing went wrong. 3. I LOVE getting to hold and nurse baby without arguing about his care, having him taken away for long hours, or anxiously waiting for husband and baby to come back to where I am. We just all got to be together. Thanks for doing this post! I love hearing encouraging words from others who have successfully homebirthed, especially since I am planning my first one soon! My reasons for not choosing to birth in a hospital this time are the same as what you have listed (comfort, control, etc.) but also I really like not having to get up and rush around grabbing bags and kids, rushing to a baby sitter and then to the hospital. I’ll really enjoy being able to just relax in my own home, and not have to rush anywhere. I loved my homebirth! I had my first 3 children in hospitals and while I was able to have natural births it felt like I was having to work against the normal flow most of the time in order to have the natural birth I wanted. I always had to be one my guard to prevent anything from being done that went against what I hoped for. I know this is just me but I didn’t like being in the hospital at all. It wasn’t comfortable and I wanted to get out as soon as possible. For my 4th child we finally stayed home and I loved it. My labor which tends to be a little drawn out was able to happen in my own home where I could go take a shower or bath as I wanted, walk around in my own home, bake bread in the middle of the night while laboring rather than just walking meaninglessly around the hospital halls, lay in my own bed or sit on my own couch. Also it was so nice after the birth the get cleaned up right away in my own bathroom and get dressed in normal clothes and then just be able to cuddle with my baby. At about 1 hour after birth the baby and I were both clean and we (my husband, midwife, sister and I) could all sit down to breakfast together. Company could come and sit and admire the baby in the comfort of our own living room. I did appreciate having the midwife and a sister who helped a ton with cleanup and care. Also for all my births my husband has been an essential help in encouraging and back rubbing and just being there! I wish a home birth was a option, but with a heart problem it is not possible. Complications have been a problem with all births and the labor is slow at first which takes a makes a great strain on my heart. My Dr. is great, she is all about hands off. She will let me decide on everything unless there is a major problem. She lets me decide on what I want as she says, I know my own body better than her and should make the choice. We would have lost the last two without being at a center as we live a hour from the hospital. Both where born not beathing and way to early to make it on there own. I have no problem with home births and pray it would be a option for my daughter someday, but there are real medical reasons some people just should not do it also. I was told I would never get preg, then when I did I was told I would never survive being preg., then later in the preg. that the babies would not survive close enought to term. Well I have been preg. 5 times and have 4 healthy children with me and one waiting in heaven. Those men in the white coats don’t know as much as God does. I trust he will have His will, and if he wants us to have more he will provide. I have yet to see or hear of a midwife who can take care of an inverted uterus or where the uterus spilts open and the baby is “born” inside the abdomen. Or what happens if you have are having a home delivery and all of a sudden the heart rate plumets and all of a sudden you need a C-section. Can’t do that at home. There is a very good reason that there are hospitals and OB-GYN doctors. A midwife does not have the training that they have and while home deliveries were common 100 years ago, many women and babies died at home. Sure, you can spot some complications, but nothing is predictable. On the other side, if there are more home deliveries and more complications, will midwives be sued just as doctors are sued now? I have labored and delivered in a free standing birthing center with midwives and I have delivered in a hospital; twice each. In the hospital environment and with the doctors one is likely to have assisting, unnecessary intervention is likely. Many women are made to believe their challenging labor needs intervention because the attending staff knows very little about holistic life and health care. However, with a good understanding of what a woman’s strong healthy body is capable of and made for, a laboring mom can have a healthy natural labor and delivery. So many of the decisions we make during this time have lasting consequences that most doctors ignore.